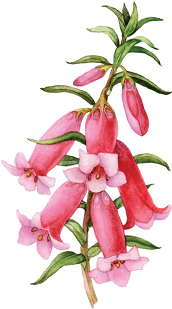 Growing Australian native plants is great fun and very rewarding, but there are pitfalls. These pages cover the fundamentals of cultivating, caring for and propagating native plants. They are based on our members’ experience and will help you avoid those pitfalls. Need advice? Advice from people with local knowledge is always available from your local APS district group. Building up garden beds, or underground drainage, can be beneficial. Do not just spread soil on top of the garden. Especially those spreading by underground runners. High phosphate fertilisers may be harmful. They help reduce weed growth and keep the soil cool, moist and friable. Light pruning promotes compact growth and more flowers. Heavy pruning kills plants which reshoot poorly from old wood. >> ANPSA’s Native plant guides. Some native plants are very particular about their preferred soil type, structure and pH (acidity / alkalinity). For example, Banksias from Western Australia mostly grow in deep sand that has excellent drainage and will not grow in heavy soils. Ensure you are familiar with the soils on your site and only select plants suited to them and your local growing conditions. The time to plant natives depends on your climate and the type of plant. Autumn is generally the best time, as it gives the plant time to establish itself before the next summer. In areas subject to frosts or cold below 2° C it is best to plant in spring after the cold has abated. Frost can damage or kill many plants – minimising frost damage is a consideration for every garden. Most of Victoria is liable to frost – areas along the Great Divide and the adjacent slopes are amongst the most frost-prone parts of Australia. In natural conditions plants are constantly subject to pruning – animals eat the foliage and break branches as they trample through the bush. Unless the damage is severe the plants survive these set-backs and vigorous, healthy new growth follows.